What is “Fairie’s Forest” mobile slot about? 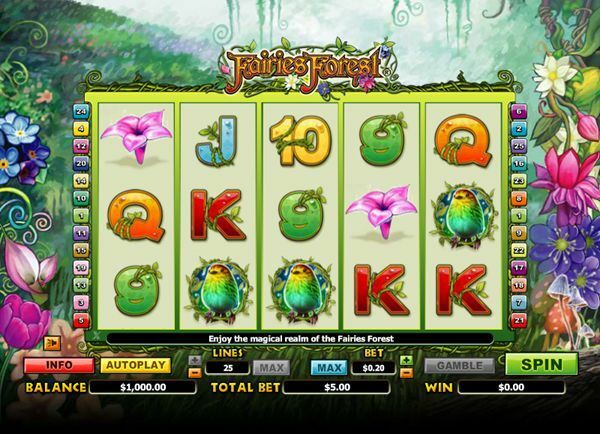 Fairie’s Forest is a mystically-themed casino slot, developed by NextGen Gaming. It is played along 5 reels, 3 rows, and 25 paylines. The coin denomination bet per line counts from €0.01 to €2.00, and any number of paylines between 1 and 25 can be activated. The maximum amount of coins per line is 25. There is no progressive jackpot in Fairie’s Forest, but the player can win up to 5,000 times their line bet, which makes the best outcome €250,000. This casino slot game can be played on any HTML5 mobile device, such as an Android-supporting smartphone, iPhone, or tablet, without the need of an additional application, software download, or registration. NextGen Gaming has succeeded in making this particular slot game very colourful and bright. The graphics, animation and sounds of are of very good quality, and run smoothly on mobile devices. All the symbols are related to the ‘enchanted forest’ theme, with vines, fairies, birds, mushrooms, and flowers scattered along the reels. The regular playing card symbols make an appearance as well. Fairie’s Forest is played for free or for real money, along 25 bet lines, with different coin denominations, which can be adjusted by using the buttons in the lower part of the display. After the player has made up their mind about the amount they would like to bet, and the amount of lines, they simply have to hit the “Spin” button. There is also an auto play feature, which allows automated consecutive normal game plays for a certain amount of spins. If the player would like to check the rules of the game, or the paytable, they simply have to click on the “Info” button. Moreover, the Max button will set your bet to the maximum with just one click. The jackpot in Fairie’s Forest slot is fixed, and counts up to 5,000 times your line bet. It is triggered by getting five rainbow birds on one of the activated paylines, and can amount up to €250,000. Apart from the jackpot, players can score winnings thanks to the wild and scatter symbols. The slot also has a gamble feature, which is activated after a win, and prompts the player to guess the colour of a card drawn. If guessed right, the winnings can be doubled or even quadrupled. The player can guess up to five times one after the other, but one wrong guess means they lose everything. The Fairy is the wild symbol in the game, and when three of them come up on the three middle reels, purple sparkles cover the entire reel before the player is given his due. The wild symbol substitutes all other symbols, apart from the sparkling Forest scatter symbol. The Forest Scatter Symbol, the other hand, pays out whenever two to five of them are present among the lines, and awards the player with up to 12 free spins, and the winning combinations during the free spins are tripled. The Forest scatter symbol could be re-triggered at any time.